The bike industry is changing and adapting, like everything else. Society wants immediacy, and it is penetrating every aspect of our daily lives. Small independent retailers are giving way to online stores that deliver directly to your door, and some consumers are choosing convenience over customer service, self-estimations over test-rides. This trend is hitting Jacksonville with the recent addition of Velofix, a franchised mobile bike shop. Velofix is only an online appointment away, whether you’re in Riverside, the Beaches or even Nocatee. They can do everything from the comfort of their van, including meet you in your front yard. They can also deliver a shiny new bike to your doorstep — no assembly required. “What we’re trying to do is offer something different to people who don’t have the time or have had a bad experience with the current bike industry,” said Velofix owner, Ryan Peterson. He gave an example of lugging your bike to the shop, having to wait a few days to get it fixed, and then when it’s finally ready, having to lug it back when you realize on your weekend ride that it’s not perfect. He said their mechanics will not close the job until the customer is 100 percent satisfied, including letting you test-ride it on the spot. According to him, they can offer cheaper prices on parts, accessories and bicycles because distributors and other intermediaries are cut out. Their clientele demographics range from 8-year-olds on BMX bikes to 70-year-olds needing service on electronic bikes. They service all of Duval County and northern St. Johns County. 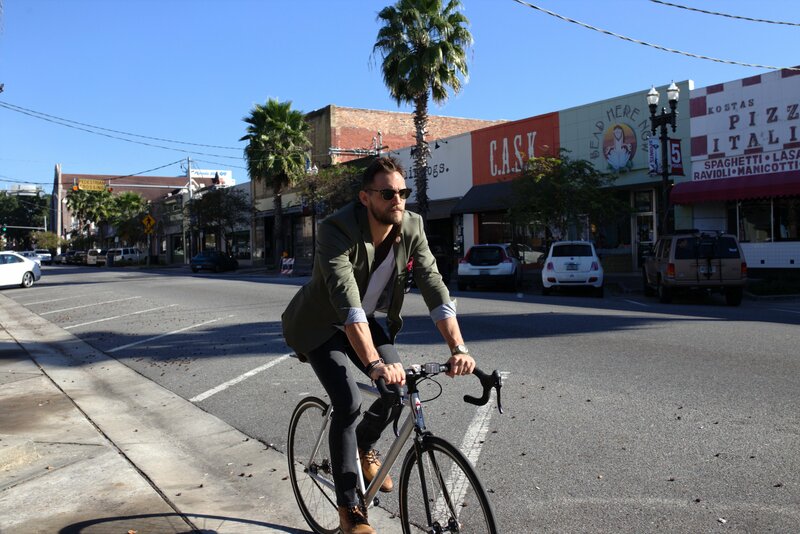 What does this mean for Jacksonville’s bike aficionados? They have a choice to make. Are they going to choose convenience or tradition? Will it be a repeat of Blockbuster vs Netflix, with the looming internet god the conqueror? Local Holt Tucker isn’t worried. He owns Open Road Bicycles in Avondale. For him, there’s nothing that can compare to the steps of building a one-on-one relationship from time spent in a store. Even though it’s convenient, a bike shop showing up at your doorstep, working and then leaving feels abrupt and less personable to him. This isn’t the first time a mobile bike shop has opened in Jacksonville. The Bike Bus is locally owned and operated by Ralph Teton, who used to work at Open Road Bicycles. He’s been working at the Beaches for over 20 years. He chose to go mobile to keep up with the industry. He thinks smaller bike stores will suffer, but the bigger chains won’t. “I don’t see bike shops totally going away,” Teton said. He still wants to support local shops, but since the Bike Bus has only been open since May 1, he’s still figuring that out. Right now, he’s partnered with Open Road, so they can support each other. The local owners think there is a need for mobile and brick-and-mortar bike shops alike. They understand each pro and con, the need for convenience and the need for amicability. They believe they can all live in a symbiotic relationship. If you follow the latest consumer trends, you’ll find that convenience is key. The rest is up to Jacksonville consumers to decide.